Early voting is way up, so what does the data reveal? Early voting is well underway in 38 states, and political campaigns and election watchers are monitoring daily updates of how many people have voted, where, and what age and race are they? Next week’s midterm elections are shaping up to be one of the highest turnouts in history, according to data from early voting around the country. More than 23 million people have already cast ballots - either by mail or in person – in the 37 states where early voting is permitted. Some states provide official daily updates with anonymous data on certain categories of voters - including their party registration, gender, age, and voting history, as well as when and where they voted - allowing political campaigns to adjust their strategy on a day-today basis. In states such as Arizona and Nevada, which both have tight Senate races, as many as 75-80% of voters may cast their ballots before election day next Tuesday. In Florida, more than three million voters had cast ballots by Tuesday morning, or about 23% of all eligible voters. That was one million more than at the same stage in 2014 a week out from election day. “It’s just remarkable. We’ve never seen anything like this in midterm turnout rates,” said Michael McDonald, a professor at the University of Florida who heads the U.S. Elections Project that monitors voting data nationwide. In some states, more people had already voted by Tuesday morning than in all early voting in the last 2014 election. Some places are going to come close to beating entire turnout in 2014,” he added. In a tweet, he listed 14 states where turnout had exceeded total early vote in 2016: Texas, Florida, Nevada, Georgia, North Carolina, Indiana, Louisiana, Maryland, Virginia, Minnesota, Montana and Delaware. McDonald is forecasting a national turnout rate between 45 and 55 percent, which would easily overtake 2014’s showing of 37 percent, the worst turnout since 1942. 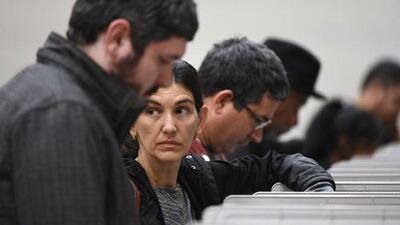 The last midterm that comes close was in 1966, when 49 percent of the country’s eligible voters cast ballots. The record is 50% in 1914. It was possible that turnout would begin to flatten out during the week, McDonald told Univision News, but there was no sign of that by late Tuesday. “More likely is it’s a question of how high is it going to go? We should have a pretty good idea by the end of the week,” he said. In Arizona, some recent polls have shown the Democrat candidate for U.S. Senate , Kyrsten Sinema, pulling ahead of Republican Martha McSally. But registered Republican voters led in early voting statistics by 10 points. However, with almost 23% of the vote being cast by non-affiliated voters, Democrats were still hopeful of an upset. In Nevada, Democrats hold a slender lead of 11,000 votes in early ballots which also show women outvoting men by 2 points. In Georgia, where there is a tight race for Governor, early voting indicates the electorate is getting younger with votes aged 60 and over making up 47% of the vote, down from 47.7%. Early voting was up 163% in Tennessee. The data published online by the Florida Division of Elections allows anyone to see how many registered Democrats, Republicans or independent (Non-Party Affiliated) voters have cast ballots in each county, as well as their race and age, while protecting the secret of how they voted. This can be enormously helpful to the campaigns as well as giving indicators of how a race is leaning, allowing them to adjust their advertising and so-called ‘ground game’ involving volunteers knocking on doors. For example, President Donald Trump is due to travel to Florida twice this week. His choice on Fort Myers on Wednesday and Pensacola on Saturday were likely selected using early voting and polling research which indicate the Republican Party needed to improve turnout in those districts. But, how useful the early vote data is for predicting the winner is less clear. For example, in 2008, early voting showed a clear trend in favor of Democrat Barack Obama, with record numbers of registered Democrats, especially low propensity African-Americans, were turning out. “We could see that Obama was going to win,” said McDonald. In 2016, he also used early voting data to predict that Donald Trump had a path to victory, despite polling that said otherwise. On the other hand, early voting data can be misleading. The night before Election Day in 2016, Hillary Clinton led early voting in Florida by almost 4 percentage points (247,000 votes), and appeared to have the election in the bag. But Trump voters still managed to overcome that by turning out in larger numbers on Election Day, allowing him to eke out a final victory by 1.2%, or 113,000. In Florida, as of Tuesday about 60,000 more registered Republicans had voted than Democrats, but that was half the margin (140,000 votes) at the same stage of early voting in 2014. Of those, there were 455,000 more Democrats who had cast ballots as of Monday in Florida than in 2014 at the same stage, compared to 374,000 more Republicans, according to Daniel Smith, a political scientist and data miner also at the University of Florida. Breaking down data showed that among the 1.25 million early in-person voters, turnout of whites had roughly doubled (up 97%) compared to 2014, while among blacks it was up nearly two and a half times, and among Hispanics and other racial-ethnic groups, turnout had tripled. That was being driven, Smith said, by a surge in independent, non-party affiliated voters who tend to be younger and more diverse. The early election data revealed that 236,000 more unaffiliated voters had cast ballots so far than 2014. Democrats are counting on the turnout of minority voters and younger voters who tend to lean their way. After the Parkland shooting tragedy in February, students from Stoneman Douglas high school and other organizations across the county rallied to increase registrations of young voters to elect politicians favorable to gun control. Schale also highlighted large swings in early voting favoring Democrats in major urban areas of the state, from Miami, to Fort Lauderdale, Orlando, Tampa and Jacksonville. Data showed registered Democrats faring much better in those areas than in 2014. For example, in Orange County, home to Orlando’s Puerto Rican voters, registered Democrats led registered Republicans in early voting by a margin of 49% to 33%, compared to only a four point margin in 2014. The practice of early voting is not new but has exploded over the last decade. In fact, it dates to the 19 th century when Civil War soldiers on the battlefield could not reach precincts on voting day. After the founding of the United States, voting was held over several days so rural voters had time to travel to town to cast their ballots. In 1845, the federal government set a uniform, single day for voting for president: the first Tuesday following the first Monday in November. This was done in part to prevent people from crossing state lines to vote more than once. In 2000, fewer than 1 in 5 voters cast their ballots early. This year, it could be nearly 4 in 10, with 37 states plus the District of Columbia allowing some form of early voting. Its widespread use has sparked debate about how beneficial it is to the democratic process. Other countries have early voting - Estonians can vote online for the week before election day and change it as many times they want - but the United States is one of the few countries that releases the data before election day. “It is a distinctly American practice, just like making voter registration primarily the responsibility of individuals,” says political scientist Paul Gronke, director of the Early Voting Information Center at Reed College, in Oregon. “Like with registration, a lot of the impetus actually comes from politicians and political actors who want to know this . I’m not sure it improves democracy—why does it help us to know how many people have voted?” he added. Critics also say it can turn people off if they realize that the result is leaning heavily in favor of one candidate or another.